Date: Sat 19 January 2019. Meet: Central Library, 12 noon. Ed Glinert, Manchester’s most prolific tour guide and hardest-working historian, who has worked with Mike Leigh and Paul Foot, will be leading a guided tour about the remarkable story. Glinert (with thanks to Paul Fitzgerald, Eva Schlunke, Robert Poole...) has unearthed an extraordinary store of tells and tales about the tragic events and the fascinating aftermath. 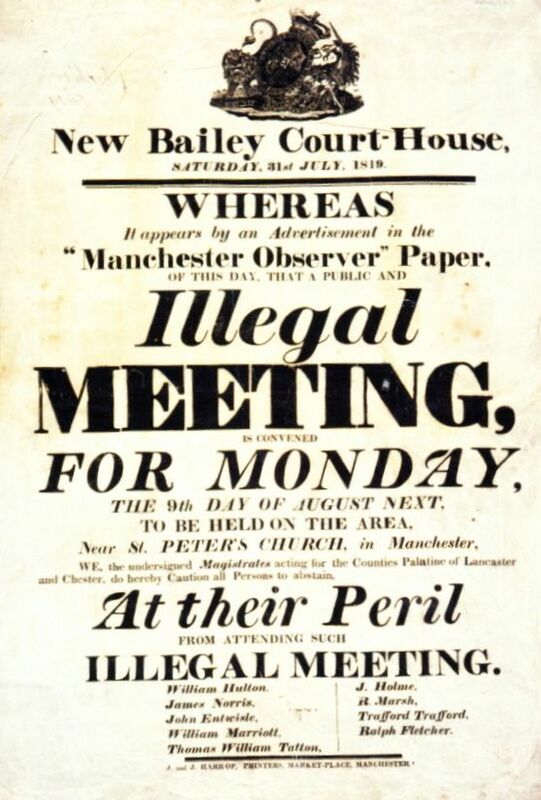 16 August 1819: troops charged 60,000 Mancunians at a rally called to lower the price of bread and demand the vote. More than a dozen people died and some 650 were injured. The event, the most violent episode in English political history, became known as the Peterloo Massacre. Glinert, political commentator with 30 years’ experience for various leading newspapers, magazines and publishers, who worked with Paul Foot on Private Eye, goes into extraordinary detail, explaining not just the momentous events of the day itself, 16 August 1819, but bringing in associated topics and characters such as the birth of the Manchester Guardian, the Cato Street Conspiracy, the remarkable story of the bones of the period’s leading radical, Tom Paine, the Government’s draconian Six Acts – even Anthony Burgess. The first few decades of the 19th century, despite being enshrined in public imagination as the elegant age of the Regency, were a time of severe political repression in England. The Conservative government of Lord Liverpool was fearful of the kind of revolutionary activity recently witnessed in France and so decided to stamp out all dissent and free speech. The government was at war with France which saw Wellington triumph over Napoleon’s forces at Waterloo in 1815. But as Paul Foot once wrote, the British government also waged war against its own people. Ed Glinert, who has researched the story for decades, brings his unique touch to this chilling story.